Since I (sirinsidiator) have taken over development of LAM-2.0 I decided it will be in the best interest of everyone to make future development a group effort. With the consent of Seerah I have put LAM-2.0 under The Artistic License 2.0 and created a github project in order to make collaborations possible. I also want to thank everyone who participated in planning and realizing upcoming changes, especially votan, merlight and Garkin. Your addons will continue to work under LAM-1.0, however that version of the library will no longer be receiving updates, and you will not receive any benefits of LAM-2.0. 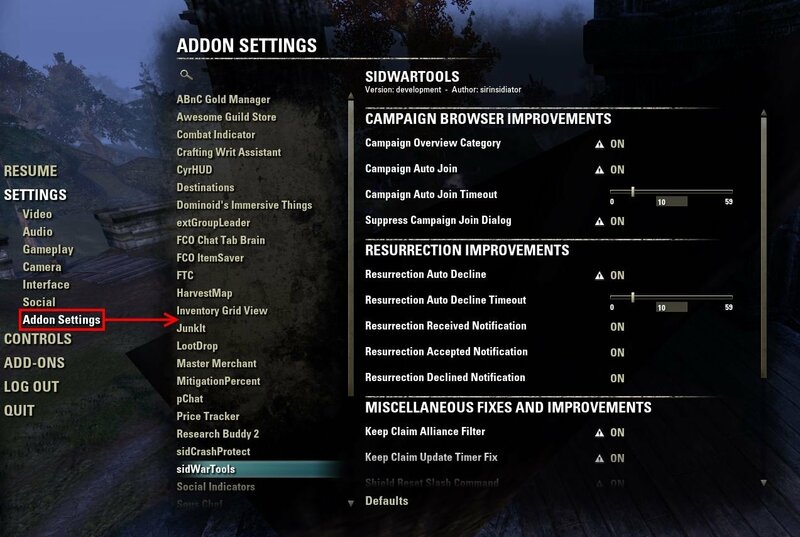 LibAddonMenu-2.0 is a library to aid addon authors in creating a configuration GUI for their addons which is located in the game's Settings menu. It supports the ability to have all of a user's addon options located in the same panel. You may see ZAM_Stats for an example of usage. You may either embed the library and LibStub in your addon and load the files from your addon manifest, or have the library installed like any other normal addon. If your addon embeds the library, you may place this line in your manifest file, just in case the user also has a standalone version installed. If you are depending on the library being installed separately and are not embedding it, then you must include this line in your text file. Either way you choose, LibStub will ensure that only one copy of the library (the newest revision) is loaded into memory. A big thank you to everyone who helped making these changes, especially votan, merlight and Garkin! - one last bug ran out from anunder the dresser - I smashed it hopefully! - copy/paste fail when changing the name of an arg. Description titles will no longer hide from you. Last edited by sirinsidiator : 04/07/19 at 07:34 AM. Any word on an update for this? Would love to be able to use Lui again. You can just check the outdated addons checkbox. I am working on an update which includes some bug fixes and new features, but I'm also busy with other addons. Until I finished, please just check the "Allow out of date addons" checkbox in the addon menu, like every other addon user. It is not some evil checkbox that will break your game and all it does is disable the comparison between a version number inside your addons and the game so they can get loaded after a game version update. Most addons will still work after a game update, but if by any chance some errors show up afterwards, check which addon names are mentioned in the message and disable them manually again until they get updated. fair enough - and not actually complaining - just inquiring minds seeking to know - that way I can make an informed decision - anyhow yes I have that box ticked at present - the other day eso just acted really wierd and kept prompting me to go to esoui to download the latest version.... which at present I have lol - eso being random. I only ask because I happen to use Azurah which depends on LibAddonMenu 2.0 - so even though that is upto date - this isn't in so far as the game is concerned hence the question - as for eso acting like that - who knows maybe it forgot that I had the box ticked - ehh it stopped it today after disabling it and reenabling it so idk eso is just being wierd. regardless thanks for the info - good to know and thanks for your efforts. Any update for Wrathstone? A lot of other addons aren't working because they depend on LibAddonMenu. [LAM2] Could not create divider 'item_name' of WykkToolbar_LAM. It doesn't stop anything from working. You just obviously don't get the dividers. Not seeing anything obvious in the API changes that has changed that would cause this, but seemed worth mentioning. Could be a ZO issue in the PTS for all I know. is missing in the wykkydsToolbar.txt. It worked in the past because you had other addons enabled that loaded this missing file. Thanks! This is part of a long list of things that have made no sense today. Last edited by Demiknight : 02/22/19 at 06:14 PM. Last edited by Schaf92 : 02/22/19 at 04:14 PM. Will the next version no longer rely on LibStub? Many addons are only requiring LibStub for LAM usage at this point. Changing LAM to no longer use LibStub would require every addon that depends on it to be changed, since it would no longer be accessed via LibStub("LibAddonMenu-2.0"). Not something I'll do on such short notice and without thinking about it very hard first. Correct, AddOnVersion > ApiVersion as AddOnVersion can be different with the same api. If the game should check both in combination you need to report this probably to ZOs. I'd say: The AddOnVersion alone is enough as you'll update it with, or w/o an ApiVersion. For the apiversion: just enable this annoying checkbox and all is OK. Addons will work if they work. AddOnVersion will be checked to load the newest files. If some files are not up 2 date: too bad, but happens. Addons still work. What you describe is not a bug in the game. When you have duplicate addons in your folder and change ANYTHING in ANY file that is loaded by the game, you need to increment the AddOnVersion. Otherwise you have two different versions of the addon code with the same version number. The APIVersion is not a tie breaker - it is completely unrelated to the addon version. In your case the game simply cannot tell which one is version it should load, so it picks the one it sees last. If you wanted it to pick the one you adjusted, you'd have to change the AddOnVersion to at least 27. Aside from that, LAM is not outdated. It works as fine as it did 3 game updates ago and I see no reason to update it without having any real changes in the code, just so you don't have to check a checkbox that everyone is already checking. You are literally the only one to complain about this in the past few years, so it is very obviously not an issue for the playerbase. In WOW the same checkbox existed for more than 10 years and it is also not an issue. They even describe in their wikis and addon guides that you have to make sure that the "Allow outdated addons" checkbox is checked. Maybe something we should do for ESO too. That said, since there is a merge for a new feature pending, I will do an update for Wrathstone which will of course also include the new APIVersion. First, the Combat Metrics add-on is not one of my add-ons. Second, LAM-2.0 is not one of my add-ons. Ergo, I cannot change either one of these add-ons in the ESOUI add-ons database because I am not its author. All I can do is to report their inconsistencies. Third, I say it is a bug because I corrected the APIVersion: values in the standalone LAM-2.0 r26 add-on for NA Live but the game still refused to load ANY copy of LAM-2.0, embedded or otherwise, from any other add-on after it had found and marked r26 as bad and OOD. Not even the standalone r26 which had the correct APIVersion: values in its manifest. The refusal to load any LAM-2.0 indicates to me, that the current game code is probably comparing AddOnVersion: values BEFORE it checks for valid APIVersion: values; therefore, the game cannot replace a bad OOD setting with a good setting whenever an add-on's AddOnVersion: values are equal (r26). This bug then prevents a standalone add-on from overriding the APIVersion: values for its embedded and OOD cousins which significantly complicates the add-on loading process. Unless, of course, you choose to turn on the OOD checkbox which turns choosing add-ons by AddOnVersion: value into a randomized crap-shoot. Last, thanks for updating LAM-2.0. It is appreciated despite our different opinions about game bugs. Thanks for your reply, Baertram. While you said the same things, the way you said them helped me see that using the OOD checkbox and the AddOnVersion: directive as workarounds to force the game to load an add-on version as the preferred add-on and to ignore other add-on versions, stand alone or embedded, should work and should work consistently. My only quibble with this solution is that it would work reliably only for my add-ons and may or may not work for anyone else's add-ons depending on how often their authors update manifests. OTOH, if ZOS opts to change their APIVersion versus AddOnVersion testing logic, the issue becomes moot and we users have to change only the APIVersion values in our manifests. I am going to take your suggestion and submit the two forum discussions (your Combat Reticle and this one) to ZOS in a Developers Forum /bug report along with specific repair suggestions for the oversight. My report will probably get rejected but I will have the satisfaction of knowing that I tried despite the "windmills" placed along the way. Last edited by Baertram : 02/06/19 at 03:36 PM. It is neither an inconsistency nor a bug. This is the intended behavior. I repeat once again: The manifest file too is part of what the AddOnVersion is describing. When you change the manifest, you have to increment the version, otherwise you have two variations of the "code" with the same version number. The APIVersion directive in the manifest is not related to the AddOnVersion, even when both contain "version" in their name. They are completely different things with different purposes and different code checking them for different reasons. Activating the OOD checkbox doesn't do anything more than disabling the check for the APIVersion directive. It is like when you manually replace the APIVersion in the manifest with the current one and follows the same set of rules. There is no "randomized crap-shoot" or anything of the likes happening. It just doesn't seem like you are trying to understand these rules and instead rather post walls of text with incorrect information everywhere. And with that I kindly ask you to stop pestering me and others about it. It is honestly becoming very annoying.